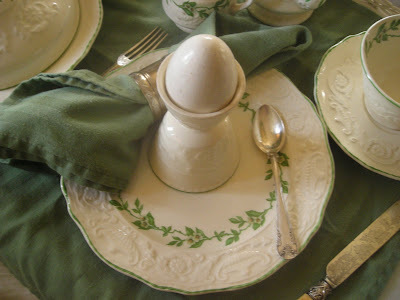 I am reposting a favorite and early Tablescape Thursday post -- for although I didn't get quite the pomp and circumstance of breakfast in bed, I was eagerly waited on hand and foot by Daughter Sarah who was home to do that -- just that! Alas, no breakfast in bed for me for I'm downstairs on the sofa and so the pretty breakfast set will have to wait for another day and another time. Perhaps used for my first breakfast after I finally get back upstairs and back in my own bed! What is one of the greatest luxuries in the world? Breakfast in bed, of course! Think of hotel room service only at home. Alas, it is not for me but rather for Daughter Sarah when she came for a visit -- alone. Time for me to pamper her as only a mother can. And so, upstairs with the breakfast tray and a favorite breakfast of hers. A soft boiled egg -- 3 minutes, please. And whole wheat toast kept warm under the dome. A wee pot of coffee accompanied by cream and sugar. For pretty -- a small bouquet of flowers. Bought years ago because I always wanted one. Think of English country homes and breakfast in bed served by a maid in a black dress with white apron. It has white roses on it and I bought it because I had wanted a breakfast set and this is the first one I found. It's called Adams Antique and it's by Steubenville. The amazing thing is that the little white roses on it so match . . . 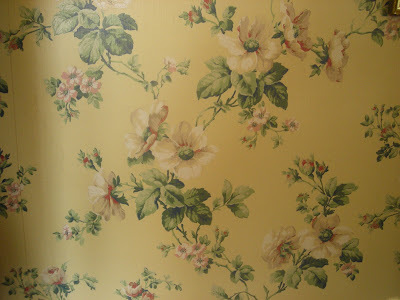 The wallpaper in the room. Papered YEARS after the breakfast set was bought. The breakfast set was not given a thought when the wallpaper was purchased for I wanted a yellow and white rose paper for the room and this one caught my fancy. However, with the breakfast set on the bed, it truly seems as if it was bought to match the wallpaper. 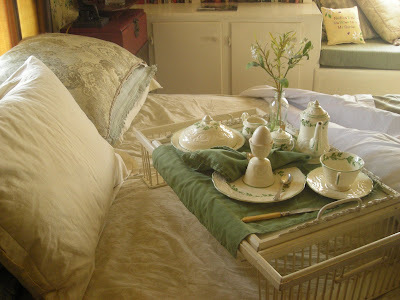 I don't get a chance to pamper Daughter Sarah often and she appreciated the leisurely breakfast in bed. It's room service -- but at home! 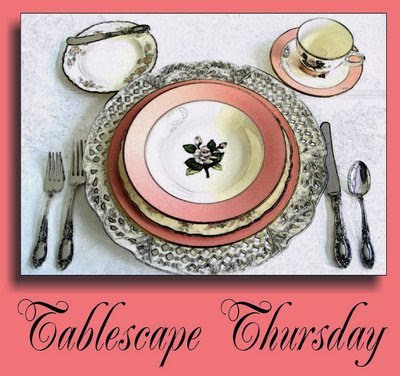 Thanks to Susan at Between Naps on the Porch, who hosts Tablescape Thursday. It's so fun to participate and share the entertaining that we do at Linderhof. I'll pass up the knee surgery, but i sure would love breakfast in bed! I hope you're staying as quiet as you can bear, and that your recovery is progressing well. I realize you are not old enough for the position but if you would ever like to adopt another daughter...........do you have a sister? I don't. How about that arrangement? Take it easy, girl. Follow doctors orders and please reprise scenes from you beautiful home, we love it! I had 2 friends that had their knees replaced. One had her second one done and had a lot of depression with that one for some reason--I think because she expected it to go just like her previous one and it didn't.But she is doing fine now. My other friend has been doing great too. Hope you will as well. Mmm, so pretty. 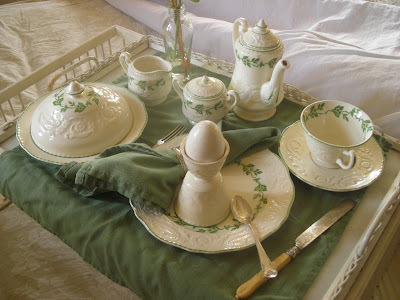 Breakfast in bed with such a pretty tray would be a treat indeed. Lucky Sarah. I hope your knee heals well, don't rush it by trying to do too much. What a spoil! Simply lovely. Good that you are taking it easy. It can't be fun. Hope the recovery is swift for you. Don't try to do anything too soon either..... it'll take time I'm sure...all surgeries do and this is pretty major stuff! I can see why you HAD to get that darling breakfast set! I love the wee sugar and creamer, especially! Such a lovely breakfast tray! I know what you mean about not being able to carry dishes. I did one tablescape while recovering from foot surgery, but my knee scooter had a basket, which helped! Happy healing! Beautiful tray and best wishes for a speedy recovery! This is such a beautiful tray! It is fun to pamper our girls. I hope that someone is pampering you as you recover and you are up and about soon. O, Martha...this is so so nice. It looks just stunning on the bed with the wallpaper behind it. Love it. Wishing you a really speedy recovery. I have several family members and friends that had this same thing done and they all recovered 100%...I know you will, too. Beautiful set and what a treat for your daughter. The room looks just like a bed and breakfast! Very comfy and inviting! Thanks for sharing. Martha, wishing you a speedy, uneventful recovery! The breakfast set is darling...so glad that your daughter has been able to be of assistance to you...when you have recovered you owe her a breakfast in bed! Breakfast in bed?? I hope so...What a delight! Get well and rest! I'm glad you reposted this -- so beautiful and, you're right, the dishes and the wallpaper are absolutely perfect together! I hope you'll be feeling much better soon. A dear frend had both knees replaced at once. She says it's the only way to go, but I'm not sure I could be that brave! I'm glad your daughter is there with you taking such loving care of you. They always say we get what we give, so her devotion speaks well for her mother! I hope you're mending well! When Life Gives You Brown Bananas . . . .
Grilled Burgers With a Twist! When the Market Gives You Lemons . . . .